Have Impact! is a blog about making a positive difference in the world. It started all back in November, with our Change Starts Here project. Despite the work I do as an aidworker, I wanted to have more of an impact in the world. Micro financing seemed like the way to go, and I kicked off a project which has now funded projects in the developing world for the total value of $12,000. 19 other colleagues, friends and readers from The Road joined our Kiva Lenders' team. It was time to give this project its own space, outside of The Road, and Have Impact! was born. On this new blog, I post updates on our loans and report on the progress of our project. 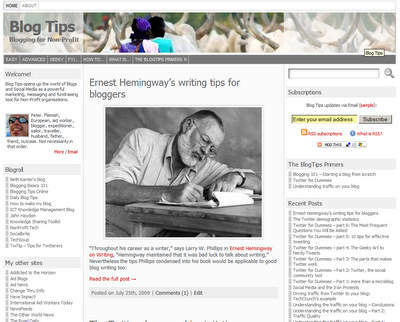 BlogTips is our second new blog. As I worked through the hurdles of finding out the ins and outs of blogging, I learned many things the hard way. On BlogTips, I try to share some of the experience, specifically for non-profit bloggers and non-profit organisations. - The Signs Along the Road contains my Internet clips. - AidBlogs with the latest posts from the aidworker blogs I feature in the side column, moved to its new domain. 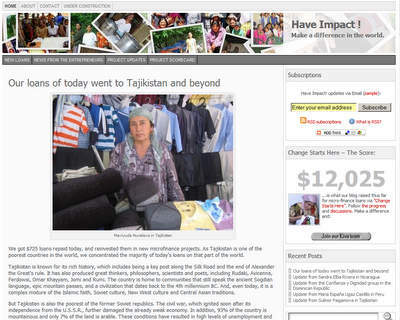 - AidNews moved to its own domain too, featuring the headlines of the latest aid news. - Change Thru Information is the 4th new domain, with the latest headlines of over 300 non-profit blogs and sites.